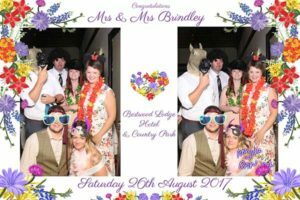 On Saturday 26 August 2017, we had the absolute pleasure of entertaining Mrs and Mrs Brindley with the Magic Mirror Photo Booth in Nottingham at the stunning Bestwood Lodge Hotel which is situated at Bestwood Lodge Country Park on the outskirts on of the city. Bestwood Lodge Hotel is an old Victorian hunting lodge, built in 1985 set in 700 acres of beautiful parkland. A stunning stately setting just 4 miles of Nottingham and overlooking some of the most beautiful countryside in the area. Claire contacted me on 1 July 2017 and knew pretty much what she wanted for her guests at her reception, she was very well organised and the whole event was a breeze to deliver. 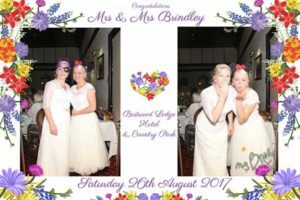 The photo surround that Claire and Angela chose was wild flowers on a white background which at first seemed quite challenging but in the end, it turned out to be one of the best examples that we have produced to date. We provided Our Magic Mirror 4-hour package with a red carpet and rails along with lots of fun disguises and props for everyone to enjoy. Set up took approximately 15 minutes and as soon as it was fired up it was launched into action, producing great photos that will add to the wedding memories of the evening for the Brindley’s and their loved ones too. All then guests left the reception with a copy of their photos and put a duplicate copy in the guest book before leaving a message for the hosts. The Guest book had to be something that would complement the photo surround so we stuck with the wildflower theme and the finished product went down very well with both the happy couple and their guests. The wedding went very well starting with the usual curious faces as we wheeled the Magic Mirror through the hotel lobby. We knew we were in for a great fun-filled evening when people started arriving and getting involved with the Star Eventz magic mirror. We love that the Magic Mirror is an open photo booth as it attracts more attention and guests than the traditional closed-off photo booth that tends to be tucked away in the corner and use more space. The staff at the venue were all extremely helpful and were on hand to help throughout the evening which helped the smooth running of the event. With the new Magic Mirror software update (which improved the already great software) the magic mirror performed even faster than before and resulted in less waiting times for guests to use the Mirror and exiting the Mirror area to collect their photos was easier than ever. This allowed us to interact with the customers more, keeping an eye on the props and helping guests to take more great photos. The guest-book looked fabulous at the end of the night and had some lovely messages in it, adding to the complete photo booth experience. 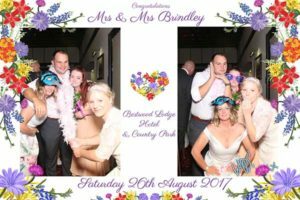 We loved working on this wedding, we felt it was an enormous success and it has given us confidence to go grow bigger and stronger in terms of delivering excellence in the growing photo booth market. Thanks again to Claire and Angela for giving us the opportunity to show case our Magic Selfie Mirror photo booth on your special day. Wishing you all the in the future.